The Prespa lake is second largest lake in Macedonia. The Prespa lake is settled in the south-western part of the Republic of Macedonia and lies in the Prespa valley, between the Resen field and Baba, Suva Gora and Galicica mountain. South - eastern of the lake Golem Grad is the point that connect the Macedonian - Greek - Albanian border. The lake of Prespa covers and area of 274 sq km, of which 176,8 sq km are in Macedonia, 49,4 sq km are in Albania and 47,8 sq km are in Greece. Prespa lake lies of an attitude of 853 above the sea level. The Prespa lake is contained from Golema Prespa and Mala Prespa and the second one Mala Prespa as a gulf, deeply enters in south-west between the Suva Gora and Galicica mountain. The length of the Prespa lake is 28,6 km and the width is 16,9 km. 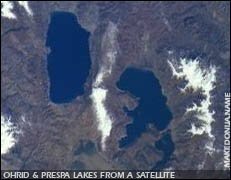 The approximately depth of the Prespa lake is 18,75 meters and the deepest point is at Golubino depression, 54 meters. On the bottom of the lake there are more depressions like, Nivicka, Konjska and Stenjska. The coast of the western part of the lake is fill of cliffs, while the eastern part of fill of beautiful sand beaches. As part of Galicica National Park, its rare plant and animal life that have been preserved through the centuries, are strictly protected. Boat trips may be taken around the island, and escorted land trips are available under the auspices of the park authorities. The Prespa lake, most important water sources are, Golema Reka, Brajcinska Reka and Kranska and the Malo Prespa lake, that is 3 meters above the Golemo Prespa lake. So through the place Perovo the water from the Malo Prespa lake flows, in the Golemo Prespa lake. The water of the Prespa lake has it's highest temperature in August, 24,3 degrees, while in the winter is the coldest and sometimes may freeze. The color of the water is variable yellow-green and heavenly blue. There are 11 types of fish swimming in the waters of the Prespa lake, of which 82% are of types of carp. While the famous are carps and the Nivicka small fish. On the east coast of Prespa lake there are many famous tourist places as Asamati, Krani, while on the western coast near the Otesevo village is the most beautiful hotel, on the shores of this lake, "Evropa". On the Albanian side of the lake, there are also 9 villages (of which 9 are populated by Macedonians), among which the famous, Pustec is on the shores of the lake. Also on the Greek side the are villages populated by Macedonians, but most of them are ruined due to the Macedonian Front (1916-1918). 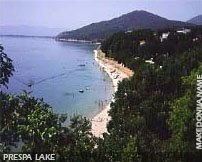 Prespa hotels - hotels and apartments in Resen and Prespa. There is one peninsula, Konjski, where the Konjsko village is settled and one island Golem Grad with it's residents, the snakes. It is also known as the island of the snakes. Today it is abandoned by people. The island Golem Grad covers an 18 hectares area. Archaeological excavations undertaken on the island have shown that it was inhabited from Hellenistic to mediaeval times. Traces of the various historical periods can be found on the island, including two 14th century churches, St. Peter and St. Demetrius. The church of St. Peter was erected and fresco painted in the 14th century, in 1360, during the reign of tzar Volkasin. It is a single-nave construction in the vicinity of which there is a small two-floor inn, a witness of the monastery life, which took place in this region.